Last night's debate may ultimately move the polls in some way, shape or form, but we won't start seeing that today. And even if we did, this group of states in which new polling data was made available may not be the best collection to demonstrate such a shift. Of the 12 new surveys from eight states, seven of them are from states that to this point have been strongly in favor of either Obama or Romney. And while that doesn't preclude some sort of movement in those states -- as an extension of an overall national shift toward Romney, for instance -- there isn't a whole lot in the data to suggest such a shift. Not a whole lot, mind you, but some. This is the first time Siena has been in the field in the Nutmeg state in 2012, and the numbers were consistent with other surveys of the state in terms of the president's numbers. However, it did understate Romney's share of support relative both to recent polling and the FHQ weighted average of the governor's share of support overall. At the end of the day, polling in the late summer hinted at a tighter than expected race in Connecticut, but the margin stretched out in the time since and hasn't contracted all that much in the time since the first presidential debate in Denver. PPP was in the field in the Bay state just a few days ago and the climate there has not changed all that much in that period of time. There was a net two point shift in the president's direction in a state that is going to tip blue anyway. PPP and Rasmussen really could not have made a better case for the FHQ weighted average in the Treasure state. Montana is currently huddled close to the line between the Lean Romney and Strong Romney states and both surveys mimicked such a breakdown; one falling on each side of that (admittedly rather arbitrary) line. 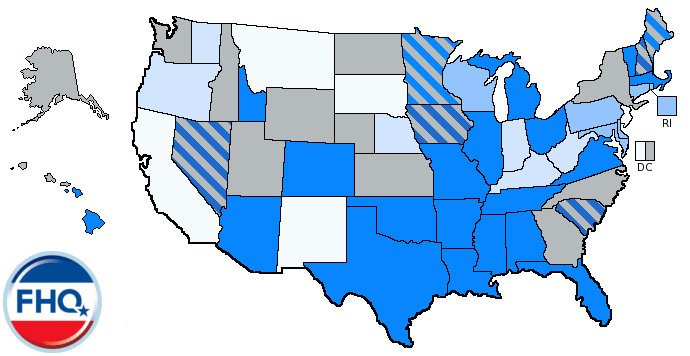 Like Connecticut and Massachusetts is firmly within one candidate's column. But in this case, it is in Romney's direction. Don't get too wrapped up in the change over for Nevada. After slipping into the Toss Up Obama category a couple of days ago, Nevada is back in the Lean Obama range. That is more a function of the collection of new polls there today and the fact that the Silver state was precariously positioned just -- and I mean just -- on the Toss Up side of the line between the two categories. It is worth mentioning that there were some rather large blips on the radar in Obama's direction before the first debate, but on the whole, most of the margins there fell in the 3-7 point range. Now, post-debate, that is more likely to be in the 2-4 point range with the +7 Obama from Grove Insight being more of an outlier than firmly within the range of results as it would have been before October 3. The Granite state is now up to four post-debate surveys. That ain't a whole lot, folks. But the picture seems to be pretty clear through that scant level of data. Of the four, three have show either a tie or a one point lead (for Obama). Things are drawing closer and the weighted average in New Hampshire is approaching that of Ohio. 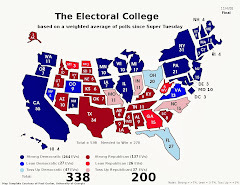 If those two were to flip positions on the Electoral College Spectrum below, there wouldn't be that much of a change owing to the small number of electoral votes New Hampshire carries. If Romney won all the states through Iowa and then picked up a hypothetically shifted New Hampshire, that would get the governor to 267 electoral votes; not enough. If Ohio and New Hampshire switched spots, Obama would not need New Hampshire. The president would only have to win the states through Ohio, but that would be cutting it very fine indeed. 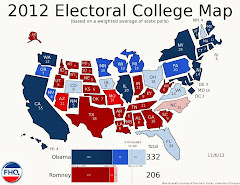 That would get Obama to 271 electoral votes; just enough to retain the White House for the Democrats. New Hampshire would not be decisive given a switch with Ohio, but it wouldn't be inconsequential either. It is an apples to oranges comparison across polling firms, but to see an Obama +7 in both Nevada and New Jersey just doesn't jibe all that well with our understanding of where both of those states are in the order in 2012. Both polls are to the extreme end of the data in both states; beyond the top end of the range in Nevada and below the low end of the range of data in New Jersey. Things have closed some in the Garden state since the first debate (The Q poll yesterday had it at Obama +8. ), but not to a level that is quite close enough for Romney to take advantage. Well, Rasmussen nailed things (...at least relative to the FHQ weighted average margin in the Evergreen state). If the +5 margin from PPP in Washington is accurate or even close to accurate, then my first reaction isn't so much Wow! as it is that we really need pollster to put down some stakes in Oregon and conduct some polls in the Beaver state. [FHQ thinks there needs to be some more polling there anyway.] As it is, this one looks now like an outlier given the other recent polling in Washington. There have only been two polls that found the race to be within 10 points and both were mid-summer. Incidentally, one of those, a July Survey USA poll, was the last time any poll found Obama under the 50% level there. FHQ said just last week that it was taking a wait and see approach with the polling in Wisconsin. Up to last Thursday, the firms that had released post-debate polls in the Badger state were all firms that had found margins on the low to mid-level of the range of pre-debate data there. I said then that if we got data suggesting a tight race -- in the one to two point range -- from a firm that had shown a double digit Obama lead before the October 3 debate, then we would have confirmation of a significant contraction there. Well, the last Marquette Law School survey before the debate had Obama up 11 points. Post-debate that margin is down to one. That keeps Wisconsin tracking downward closer to a point of parity between the two major party candidates. Well, Nevada jumped back into the Lean Obama category, but that seems like a temporary change in the grand scheme of things in this race. 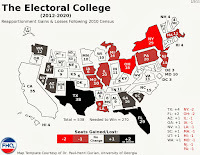 That shifts those six electoral votes back across the line into the lean area leaving 79 vulnerable electoral votes in six states to which the president is currently clinging (by FHQ's measurement). Of course, 51 of those electoral votes (Florida, Colorado and Virginia) may be a little closer to the partisan line and Romney than the FHQ metric lets on. In the zero-sum game that is the fight for most electoral votes, that increases Romney's paths to 270 by reducing the president's potential paths. That race could conceivably be one that rests on who wins the group of five states between Wisconsin and Iowa. ...or it could more simply mean that if Romney wins Ohio (along with the three light blue states mentioned above), he wins by claiming 275 electoral votes. The Watch List only saw Nevada switch back to being on the cusp of shifting into the Toss Up Obama category (something that seems inevitable anyway), but it also added Wisconsin. The Badger state, too, is now within range of a shift into the Toss Up Obama category. And if the polling continues to show a narrow Obama lead, we will continue to see the average margin there contract. Beyond those two states, Florida, New Hampshire and Ohio are also worth looking most closely at when new data is added for each.